If the Affordable Care Act were a celebrity, it would be that really big star you either love or hate—or maybe love to hate. 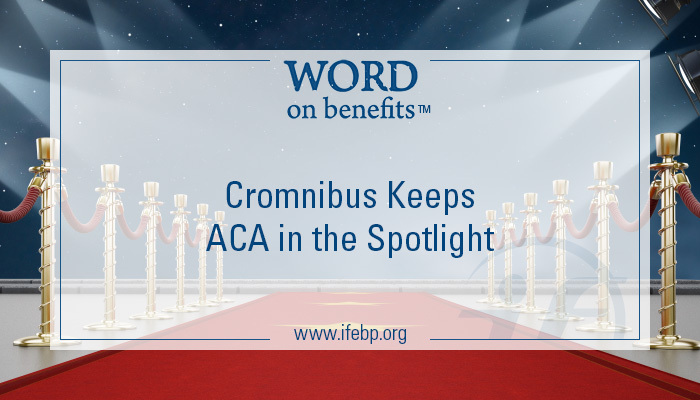 Since 2010, ACA has commanded the U.S. employee benefits spotlight. However, not even the most famous celebrity can hold everyone’s attention all the time. In December, a scene-stealer called MPRA (Multiemployer Pension Reform Act) debuted in the Consolidated and Further Continuing Appropriations Act, 2015 (Cromnibus), diverting attention from ACA. Expatriate health plans meeting certain basic requirements will be considered “minimum essential coverage” satisfying the individual mandate. The Expatriate Health Coverage Act, incorporated into Cromnibus, makes permanent the rules exempting expatriate health plans from many ACA market reform provisions, including annual and lifetime limits, essential health benefits, Summary of Benefits and Coverage requirements, PCORI fees and reinsurance fees. The act extends the exemptions to self-funded expatriate plans. However, all expatriate plans are still subject to the Internal Revenue Service (IRS) and employee reporting requirements of Sections 6055 and 6056 and may be subject to the Cadillac tax. Cromnibus cut $350 million from the IRS budget, making it harder for the IRS to implement parts of ACA, such as determining, distributing and recovering premium tax credits and enforcing the individual mandate. $10 million out of the $15 million originally appropriated for the Independent Payment Advisory Board (IPAB) is rescinded. IPAB is a board that would limit Medicare’s rate of spending growth. IPAB has never been operationalized. The Centers for Medicare and Medicaid Services (CMS) is prohibited from using Medicare program funds for non-Medicare ACA activities. Some restrictions are placed on the ACA’s Prevention and Public Health Fund increasing transparency regarding what the funds are used for. Cromnibus declares ACA’s risk corridor program must be budget-neutral. The risk corridor program affects qualified health plans (QHPs)—plans qualified to participate in the public exchanges—by minimizing the risk of offering coverage to all applicants, which could include a large proportion of people with higher-than-average health costs. The risk corridors program works by transferring funds from QHPs with lower-than-expected costs to those with higher-than-expected allowable costs. Cromnibus does not allow CMS to use funds from other accounts toward risk corridor payments. The risk corridor payments to QHPs may come only from risk corridor collections from other QHPs. If all the benefits world’s a stage, pension reform’s MPRA is an up-and-coming player. The more-seasoned ACA keeps making news, however, due in part to its frequent transformations. Remind you of any celebrities? Keep up with ACA’s latest transformations on ACA University. A free member service offering the latest news and insights you need to know about.